Welcome to The Official Fast Diet and recently added Fast Exercise Forums. We hope you find these useful and informative. We are delighted by the response to our books on intermittent fasting and on exercise combining high intensity interval training (HIT). We have received so much positive feedback from people, telling us how much it has benefited them. The idea of intermittent fasting is that it is a lifestyle change more than simply a diet, so we expect it to generate a lot of questions. Let us know how you are getting on with the diet and the exercises, what you have discovered, your top tips, recipes and anything you want to know or share. We have a well informed and supportive community who will encourage you on your way and throw in some of the latest research to keep you motivated. Good luck and we look forward to hearing from you. Just joining? Introduce yourself here. Tell us how it's going for you. Do you have a story of change? How are you fitting fasting into your life? How is going with family and friends? Come chat to support and encourage others on the diet. How do you handle the day to day mealtimes for the family? 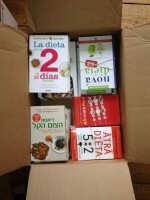 A collection of recipes Mimi Spencer and others have published here and across the web for 5:2 diet days. This is the forum to discuss what you eat when you're not eating. What do you do when you're eating away from home or not cooking? What are your best tips for approaching food?